La divulgation des ratios, PCD (CEO)/ Moyenne des employés, aura-t-elle un effet sur le comportement des consommateurs ? On se demande souvent comment faire pour réduire les rémunérations de plus en plus excessives des CEO, surtout en comparaison avec la moyenne de leurs salariés. Gretchen Gavett, dans un article publié le 4 juin 2015 dans HBR, a peut-être découvert un bon moyen de sensibiliser les clients : utiliser l’argument du ratio CEO/ Moyenne des employés afin d’inciter les consommateurs à acheter chez le détaillant qui offre le meilleur « rendement ». « It’s one thing to ask whether people are aware of the realities of these ratios, however. It’s quite another to predict whether their behavior will change based on that knowledge. If companies and countries were more transparent about salary, would it really have an effect on how people view the company — and, by extension, will it change whether they buy what it sells? 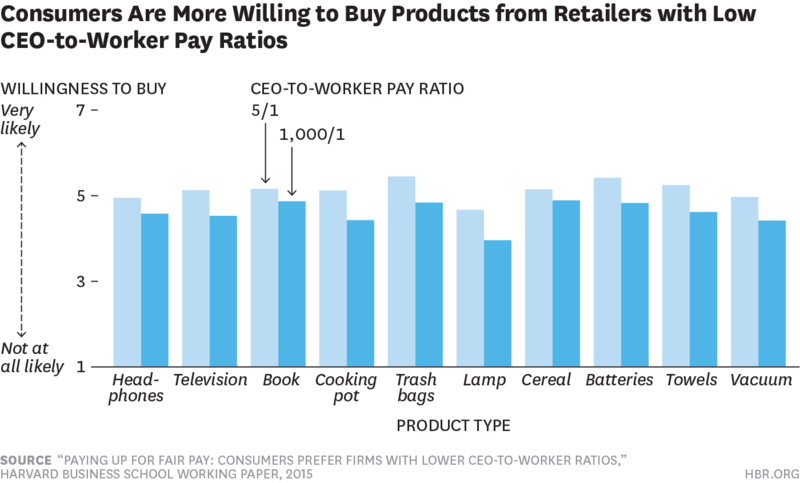 The answer, at least according to a new working paper, is “yes.” Consumers report being more likely to buy from companies with CEO-to-worker rations closer to what they deem fair ». Voici donc un bref résumé de l’article de la revue HBR. Bien sûr, avant d’utiliser une telle stratégie, il faut une divulgation du ratio en question, ce qui n’est pas encore le cas ! Mais cette étude apporte de l’eau au moulin de ceux qui sont favorables à une telle divulgation. Is Your CEO’s High Salary Scaring Away Customers ? Let’s say you’re in the market for some new towels. Nice towels, oversized and made with 100% Turkish cotton. They’re priced below your budget and in stock at a well-known retailer with both brick-and-mortar and online stores. So far, so good. But what if you were told that the retailer pays the average employee $22,400. Its CEO, $24 million. That’s a ratio of 1000 to 1. How do those towels sound now? Currently, companies aren’t required to disclose their CEO-to-worker pay ratio (in the U.S. specifically, the provision of the Dodd-Frank Act calling for such disclosures has yet to be adopted by the SEC). At the same time, research is beginning to peel back the layers about what the general public knows about executive compensation — and all indications are that we’re woefully ignorant. For example, people drastically underestimate the compensation difference between average workers and Fortune 500 CEOs; globally, they say their ideal pay ratio for CEOs to unskilled workers is around 4.6 to 1. According to the AFL-CIO, the actual number is closer to 331 to 1 in the United States (most other developed countries have lower ratios than the U.S., but are still higher than the ideal). Bhayva Mohan, a doctoral student at Harvard Business School, along with professors Michael Norton and Rohit Deshpande, set up several experiments to gauge consumers’ willingness to buy products when equipped with knowledge about the CEO-to-worker compensation ratio of the company selling them. Which brings me back to the towels. In the first three parts of the study, the researchers asked respondents (whose numbers ranged from more than 400 in the first experiment to between 100 and 160 in the second and third) about their willingness to buy a towel set under different conditions. Some were given a CEO-to-worker pay ratio of 1,000 to 1 (the estimated ratio at Walmart, given the information available, though respondents weren’t told this); others were given an ideal ratio of around 5 to 1 or a reality-based one of 60 to 1 (the estimated ratio at Costco); and in the third study, they were given options of comparing retailers with high and low ratios. Across the board, people were more willing to buy from the company with the lower pay ratio, and more than 30% said they would pay more for the towels when given the option of two different companies with two different compensation ratios. But the researchers knew that there could be a handful of ways a low ratio could backfire, too. For one, knowledge of the ratio along side of certain types of products could indicate a lower quality. It might also indicate the company is too warm and fuzzy, and thus seen as less competent. Finally, different political and economic beliefs among consumers could also change their willingness to buy. So the researchers then tested against these assumptions, too. First, they found that the type of product didn’t much matter — the 151 people in this experiment were still more likely to buy from a company with a lower pay ratio. These tests led Mohan and her coauthors to conclude that an egalitarian compensation strategy “increases positive perceptions of most customers without harming perceptions of other customers.” In other words, your more politically conservative customers won’t run screaming if your CEO is paid a bit less. 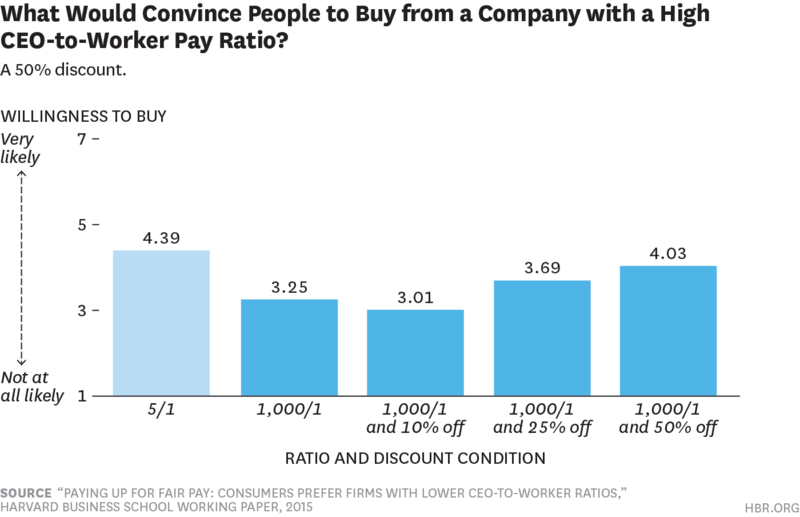 In addition, they tested whether discounts might help consumers overlook high CEO-to-worker pay ratios. They don’t, until you slash the price of an item by 50%, according to a survey of more than 350 people. “We were surprised by how steep a price discount it took to make the products offered by high pay-ratio firm as appealing to consumers as the low pay-ratio firm,” Mohan told me over email. 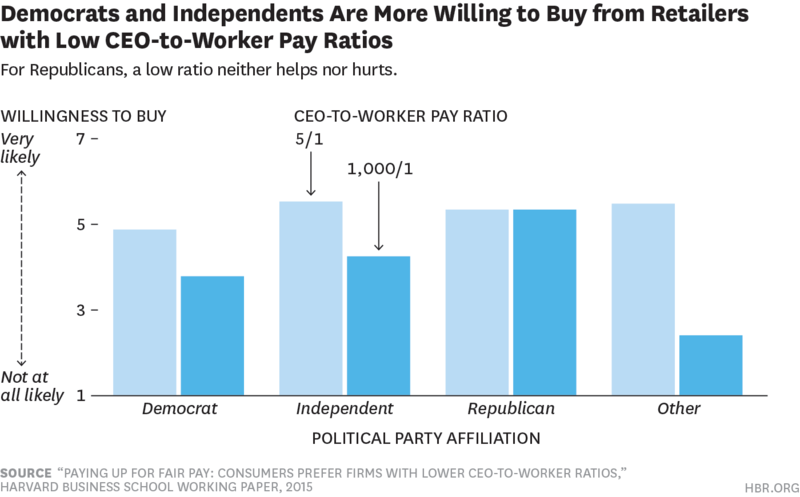 So should companies be more strategic about making lower CEO-to-worker pay ratios public? Transparency can be a tricky thing. While showing the work that happens behind the scenes can sometimes pay off, like in the case of travel sites that visually indicate they’re trying to find you the best possible flight, disclosure can also backfire. “When websites reveal their processes only to suggest poor options (say, an unattractive date), consumers react more negatively,” write Mohan, Norton, and Deshpande. *Gretchen Gavett is an associate editor at the Harvard Business Review. Follow her on Twitter @gretchenmarg. « Vous prenez un nouveau poste ? Bravo, mais attention !